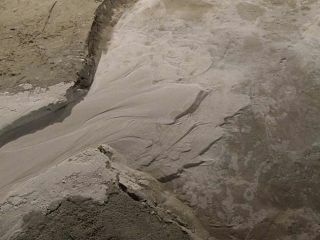 A Martian delta simulated by the Eurotank, a massive erosion simulator in Europe. The step-like patterns formed by a rapid release of water mimic features seen on Mars. Crusty,dusty and rusty describes the Mars of today. Surfacefeatures of the Red Planet, however, hint at a watery past where torrents ofgroundwater carved out deep canyons, formed sweeping fans of sediment andcemented together huge fault lines. "Groundwaterprobably played a major role in shaping many of the things we see on the Martiansurface," said George Postma, a sedimentologist at UtrechtUniversity in the Netherlands. Postmacollaborated with Virginia Tech's Erin Kraal and others to recreate Mars'fan-like sediment deposits with a scale model. The group detailed their findings in a recentissue of the journal Nature. A separatenew study by Allan Treiman, a scientist at the Lunar and Planetary Institute in Houston, details the role of groundwater in depositing minerals in rockyMartian crevices. Scientiststhink amassive ocean once covered one-third of Mars, and recent photographssuggest that pockets of water may still be hidden beneath the planet's surface.Water is crucial for life as we know it, so signs of underground water now —and more extensive amounts of water in the past — both suggest Mars was ormight still be habitable, at least to microorganisms. Postma saidsuch reservoirs of water probably carved out canyons, rapidly depositingstep-like layers of sediment in Martian impact craters across the planet. "When we examined photographsof Mars, we saw that some deltas had steps of material," Postma told SPACE.com.He noted that such formations are seen on Earth only where water rapidlydeposits delta sediment, such as parts of the Sahara Desert's Lake Chad. "Basedon our models, these structures might have been caused by catastrophic eventsthat filled the craters in one go," he said. Instead of taking millions ofyears to form, Postma said the fans probably formed in decades. Ancienttorrents of water spilling out of Martian ground with the output of theMississippi River, for example, could have formed some of the dozen step-likesediment fans the researchers observed in about 13 years. "Anotherpuzzling feature is that you don't see a drainage network along the crater'sside," Postma said — yet another clue that fans' formations were rapid andnot the product of rainy runoff. "Craters are thought to be very porous,so the water can sink through. Another possibility is that the water justevaporated into the Martian atmosphere." In VallesMarineris, where about 2,500 miles (4,000 kilometers) of 6-mile-deep(10-kilometers) chasms dwarfing the Grand Canyon stretch over Mars, Treimanthinks he has located more evidence of groundwater at work. "Groundwateris a crucial reservoir in Mars?s global water cycle and plays an important rolein ? alteration of bedrock," Treiman writes in his study, detailedyesterday in thejournal Nature Geoscience. The VallesMarineris canyons formed when massive slabs of rock both lifted up andsunk, creating fault lines in the process. Spacecraft imagery of the landscapeshows the crevices as ridges, which Treiman thinks were filled withmineral-rich groundwater between 3.5 billion and 1.8 billion years ago. "Thisinterpretation implies that liquid water was stable at or near Mars?s surfacewhen the fault zones were cemented," Treiman said, noting that only a"warm wet" climate on Mars could have made the deposits possible. "Thepresence of liquid water is important in current ideas of Mars?s history,"Treiman said, "and central to Mars?s potential for life."